Libra January 2016 horoscope forecasts that social grace and flexibility are needed to achieve your targets in life. You can assess your personal characteristics and outlook, and make pleasant changes to enhance your looks. You will pay attention to improving your inherent capabilities to form a bigger social circle. Most of the planets are in the Southern hemisphere of your horoscope during January 2016. It makes sense to concentrate on family and domestic concerns. Professional issues can be on the back burner for the time being in January 2016. The Libra zodiac sign will be engaged in improving their emotional strength which will ultimately help their life in general. 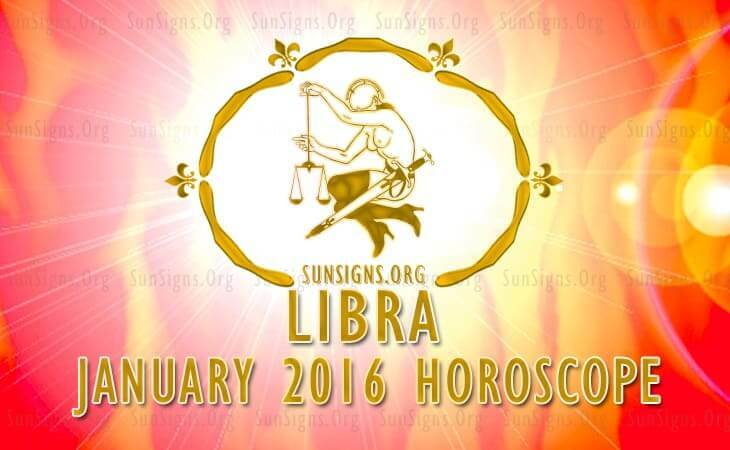 The Libra 2016 January predictions foretell that professional life will be more harmonious and satisfying. People in search of jobs will be surprised with unexpected job offers. Businessmen will look for progressive and challenging opportunities during the Mercury retrograde this month. Financial strength is superb this month for people of the Balance sign in 2016 January. You have the overwhelming support of family members and social circle in furthering your monetary interests. You will reap financial windfalls if you are focusing on sales promotion and marketing of products. Making money gets tougher after 20th and you have to slog to accumulate the same amount of wealth. The Libra 2016 astrology forecasts suggest that your spouse will be engaged in a financial venture which is likely to sap his or her energies, but it will be beneficial for the family. Your partner will need to focus on keeping their vitality high to meet the challenging demands. Some problems in the family will disturb the harmony at home. Relationships with children might be difficult. Pregnancy is best avoided. Dating online during the month will be light and will be more for entertainment. Single Librans will find their love mates in some strange places and love will be more passionate during the month. If you are already in a romantic relationship, expect turbulence due to your flirting expeditions. Physical health for the Libra will be without major problems till the 20th. After that your energy level will be fantastic. Regular exercise and relaxation techniques will boost your health. To conclude, the January 2016 Libra monthly horoscope foretells a period of socializing and paying special attention to family.